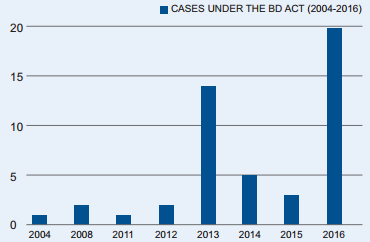 A just-published study has revealed the Government of India (GoI) has not been supporting litigations arising from violating National Biological Diversity (DB) Act, 2002, pointing towards how the National Biodiversity Authority (NBA), the country’s watchdog for implementing the Act, has been at the “receiving end” for most of the litigations. A statutory autonomous body, NBA functions under the Ministry of Environment, Forests and Climate Change, GoI, and was established in 2003 to comply by the Convention on Biological Diversity (CBD), which India signed in 1992. Yet, the study regrets, “Though forest officials usually man the SBBs, it’s not very often that the BD Act is used by field-level forest officers to deal with smuggling of bioresources, such as exotic wild species.” It adds, this is because the Act has not been “properly known and understood” and is therefore “rarely invoked”. The study, funded Foundation for Ecological Security (FES), Anand, Gujarat, with research carried out in collaboration with Kalpavriksh Environmental Action Group, analyses 50 cases with respect to provisions of the BD Act or its rules/ guidelines between 2004 and 2016.